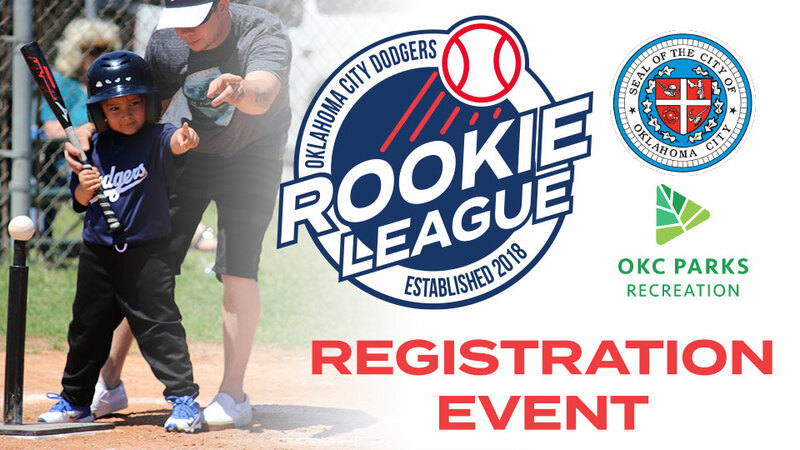 OKLAHOMA CITY - Registration is open for the second season of the Oklahoma City Dodgers Rookie League, a youth baseball league formed in 2018 via a partnership between the OKC Dodgers and Oklahoma City Parks and Recreation. Individuals interested in participating can register in-person during a fun, family-friendly event from 11 a.m. - 2 p.m. Saturday at Chickasaw Bricktown Ballpark. Families can enjoy inflatable games, lawn games and face painters Saturday, along with complimentary snacks and hot beverages throughout the event. Oklahoma City Parks and Recreation staff will be on-site to answer questions and assist with sign-ups. Individuals who register at the event will receive 25 percent off merchandise at the OKC Dodgers Team Store Saturday and will be entered for a chance to win a $100 equipment shopping spree. Free parking is available in the Joe Carter Lot, located east of the ballpark, and attendees can enter through the Mickey Mantle Gate on the ballpark's west side. The OKC Dodgers Rookie League formed in 2018 to help increase youth baseball participation in the community, as well as foster an environment that emphasizes leadership, teamwork and sportsmanship. The timing was in response to Oklahoma City Parks and Recreation canceling its baseball league in 2017 due to low participation. The OKC Dodgers stepped in to provide resources to help reduce costs and make baseball accessible to more area youth. The OKC Dodgers provide jerseys, hats, belts and equipment for each team. Registration for the OKC Dodgers Rookie League costs $55 per participant to help cover operation expenses, such as umpires and field maintenance. The league consists of four baseball divisions to accommodate boys and girls in multiple skill levels and age groups. Teams will compete in divisions of 4U T-Ball, 6U T-Ball, 8U Coach Pitch and 10U Kid Pitch. Practices will be held once per week starting the week of March 25. Game play begins April 6 and runs through June 1. The season schedule consists of seven games played at Wheeler Park, located at 1120 S. Western Ave. An on-field parade for OKC Dodgers Rookie League participants will be held prior to an OKC Dodgers game at Chickasaw Bricktown Ballpark in May and closing ceremonies will take place at the ballpark in June. The deadline to register is Feb. 18, and in addition to the sign-up event Saturday, players can register online at: http://www.bit.ly/OKC_2019RookieLeague. Individuals interested in coaching or volunteering for the OKC Dodgers Rookie League can call (405) 297-1489 or email christopher.lucas@okc.gov. To benefit the OKC Dodgers Rookie League for 2019 and beyond, the Oklahoma City Dodgers Baseball Foundation will host a trivia night fundraiser Saturday, March 30 at Chickasaw Bricktown Ballpark. Money raised will be used to provide scholarships for participants to cover registration fees and help expand the program overall. Registration for the trivia night costs $200 for a team of up to eight people. For more information, please contact Jill vanEgmond at (405) 218-2104 or jill.vanegmond@okcdodgers.com. To learn more about the OKC Dodgers Rookie League, visit okcdodgers.com/rookieleague or contact Grant Hansen with Oklahoma City Parks and Recreation at (405) 297-1591 or grant.hansen@okc.gov.